Velma Y. Wiggins, 82, of Eldorado, Ill., passed away peacefully on Sunday, November 18, 2018 at the Ferrell Hospital in Eldorado. She was born in Raleigh on February 26, 1936, the daughter of the late Clive and Elizabeth (Dugger) Bishop. On September 11, 1960 she married Jack L. Wiggins and then moved to Eldorado where they lived together happily for fifty-eight years. Velma worked at General Telephone Co. and also as a dental assistant but in her later years enjoyed her role as a loving wife, mother, grandmother, and homemaker. She was a lifelong faithful member of the Restitution Church of God and also a member of the Eldorado Garden Club and the Saline County Homemakers Association. 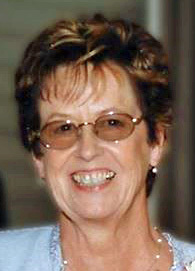 Velma is survived by her loving husband: Jack Wiggins of Eldorado; son: Barry Lee and Michelle Wiggins of Westfield, Ind. : daughter, Rhonda Lynn and Al Lenkaitis of Eldorado; and son: Matthew Kyle and Carrie Wiggins of Eldorado; one brother: Norman and Felecia Bishop of Olney; one sister: Beverly Hays of Harrisburg; nine grandchildren: Ben and Abbey Wiggins, Briley, A.J. , Caden, and Denver Lenkaitis, Dillon, Braden, and Liam Wiggins. She was preceded in death by her parents; four brothers: Phil, Darrell, Bill and Roger Bishop. Visitation for Velma will be held on Friday, November 23rd from 4 to 7 p.m. at the Colonial Terrace Funeral Home in Eldorado. Funeral service will be at the funeral home on Saturday, November 24th at 1 p.m. with the Dr. Brian Atra officiating. Burial will follow at the Wolf Creek Cemetery near Eldorado.